The aim of digital signage for this sector does differ slightly from others as the focus is usually on making a customer feel at home in an unfamiliar environment. Whether it’s a hotel, restaurant, a cruise ship or a nightclub, it’s important to inform your guests about services and facilities that are on offer before anyone decides to use them. Essentially, the ability to deliver this information effectively and to the right audience depends on your content and location of the screens. For more information on how to choose the right location and create effective content, take a look at one of our previous blogs on how to capture your customer. Not only is it important to get the location right, but digital signage is also about open technologies that communicate with each other. For example, people often take photographs of their meals they have ordered at a restaurant on their phone. One part of your content could include a Twitter feed widget. Your ask customers to share their photos via Twitter and the feedback will then be displayed on the screens. Including your customers in the business creates an extremely memorable experience. This is also a way to generate sales, as people in the restaurant may choose certain meals based on customer comments rather than the menu alone – include images of your more expensive dishes and more customers may just start pay that little bit extra. 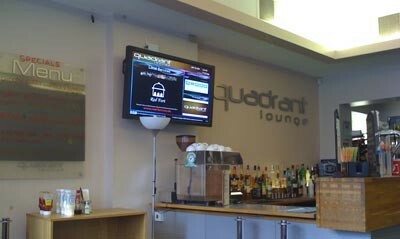 So what can you use digital signage in the hospitality industry for? The examples above are just a selection of ways in which you can use digital signage. Once you have clarified what you wish to use the digital screens for, it’s essential you choose the right software to suit your needs. We offer a simple cloud-based solution, digitalsignage.NET, or our Enterprise software which you can learn more about here. We also have a free informational whitepaper for you to download if you are interested in a digital signage solution for your hospitality establishment – it includes statistics, the benefits of using digital signage and how it compares to other communication channels. To download just click on the image below. Request a free consultation with us today or contact us if you would like more information. 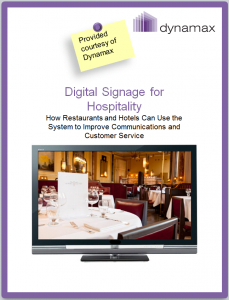 This entry was posted in Digital Signage, Tips and advice and tagged #avtweeps, #digitalsignage, #proav, digital signage for hospitality by Dynamax. Bookmark the permalink.